I’m seeing a lot of DIY Halloween action this year, and it’s still relatively “early” in the season. I predict we’re in for a great year. Keep creating, Halloweenies! 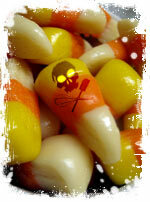 One industrious sweet tooth decided to revamp the holy grail of Halloween treats and make homemade candy corn. Melisser wanted to enjoy its simple sweetness sans the sucky ingredients, so she tweaked a recipe from the Epicurious Editor’s Blog- with perfect results- and shared her success story online. Visit her blog for a step by step recipe with pictures. If you make your own homemade candy corn, let us know how it turned out! Subscribe to comments with RSS or TrackBack to 'Homemade Candy Corn'. Awesome site! great to see you’re in the spirit 365! Thanks for sharing all your knowledge for free. Will definately refer all my friends here in Boston to this site.